Sixty percent of adult Americans now take some type of nutritional supplement accounting for $36 billion in sales in 2014. To discuss all of them would require a tome thicker than Webster’s Dictionary, so I’ll restrict this post to multivitamins. Almost 80% of physicians recommend them to patients, while more than 70% take one themselves. Half of all American adults take a multivitamin at least some of the time. Should you? What is a vitamin anyway? Simply put, vitamins are organic molecules that the body cannot independently synthesize at levels high enough to maintain health. They must, therefore, be supplied in the diet. A little more than a century ago, Polish biochemist Casimir Funk observed that brown rice was capable of staving off beri-beri and set about isolating the mysterious molecule involved, which he termed a vitamine (short for “vital amine-containing-compound”). He went on to describe 3 additional vitamines (the ‘e’ subsequently dropped) that were capable of preventing diseases: vitamin B2 (pellagra), vitamin C (scurvy), and vitamin D (rickets). Since that time scientists have isolated many additional vitamins including: B6 (pyridoxine), B12 (riboflavin), biotin, folic acid, pantothenic acid, and vitamins E and K. In addition, the body also requires a steady supply of minerals [e.g. sodium (salt), potassium, calcium, magnesium, phosphorous, iron, sulfur, iodine, fluoride, copper, manganese, and zinc], a few essential fatty acids (lipids) and amino acids (the building blocks of protein). But in a nation where 70% of adults are overweight, do we still need to worry about nutritional deficiencies? When was the last time you saw anyone with scurvy or rickets? The fortification of our foods with a host of vitamins has made these diseases a thing of the past. And while it’s clear that the absence of vitamins causes disease, it’s a giant leap to assume that their surplus promotes health. I’m not saying that there aren’t instances where taking vitamins doesn’t make sense but, for the most part, they are specific instances for specific vitamins, like folic acid in pregnant women to prevent fetal neural tube defects, or vitamin D and calcium supplements in postmenopausal women to prevent fractures. In this post I’m referring to the general population, where the data to support multivitamin use is doubtful at best. We’re all busy. We skip meals, snack too much, eat out too often, and shop more than we should from the middle aisles of the grocery store where all the additive-laden foods are kept. We rarely eat organic and seldom stop at farmer’s markets. The American diet is calorie dense and nutrient poor, so what’s wrong with a vitamin supplement to act as an “insurance policy” on our health? Nothing, if they actually work to promote health, prevent disease, or increase longevity. But if they do none of those things then we’re just wasting our money on expensive urine, as that’s where all the extra water-soluble B-compounds and vitamin C ends up. Meanwhile, the fat-soluble vitamins (A, D, E, and K) are stored inside us where data shows that too much of any of them does harm, not good. It’s clear that we get more benefit when we ingest our vitamins in the form of food rather than pill form, and to the extent that people rationalize the use of a multivitamin to continue eating poorly, their use may be promoting harm. In 2013, an independent group of doctors comprising the US Preventative Services Task Force failed to endorse routine multivitamin use and actually recommended against taking vitamin E and beta-carotene supplements. In fact, there are no government health agencies or professional organizations (outside of the vitamin industry) that recommend routine multivitamin use. The data isn’t there. And while multivitamins aren’t expensive, they aren’t necessarily cheap; a bottle of 200 Centrum Silver tablets retails for $20.49 at Walgreens, a mark-up considerably higher than on fresh fruits and vegetables at your local grocery store. I don’t know about you, but if vitamins aren’t going to make me feel better or live longer then I’d rather spend that same money on a gym membership. Unfortunately, nowhere is the research more conflicting and confounding than in the diet and supplement industry. By necessity most studies in this field have been observational in nature (i.e. watching what happens to two groups of people over time and trying to tease out the variables associated with a given outcome like heart attack). The problems start when other variables besides the one being observed are contributing to, or responsible for, the outcome in question. Simply observing what happens without controlling for these variables can lead to markedly disparate, even opposite, conclusions. Consider a group of middle-aged people with fatigue and malaise who decide to take a multivitamin in the hope that this will restore their vitality. Let’s further assume that the reason some of them are feeling so run down is because they are actually harboring an undiagnosed cancer that will go on to kill them in the next few years. This group will ultimately have a higher death rate than a group of similar non-vitamin takers without cancer. The obvious—but erroneous—conclusion from a study like this is that vitamins cause cancer, as the group of vitamin takers will exhibit a higher cancer mortality than the non-takers. Now consider another group of vitamin takers comprised of highly motivated folks who watch their weight, don’t smoke, enter running races, and take a number of nutritional supplements to support their health. When researchers follow this group over time they find a lower risk of death versus their couch potato, non-vitamin taking peers, leading to the equally false conclusion that vitamins, rather than the other lifestyle interventions mentioned, are responsible for the longevity. Are eggs good or bad for you? How about butter? I’ve been around long enough to see the pendulum swing and have come to recognize that the reason so many of these studies derive conflicting results is more often due to flawed data than flawed analysis. Garbage in, garbage out. When it comes to multivitamin research the data have often been sketchy, but we now have a very good study from which to draw conclusions. The Physicians’ Health Study II from the Harvard School of Public Health followed more than 14,000 male physicians, aged 50 and older, from 1999 until 2010, comparing regular multivitamin use to a placebo. They looked at outcomes regarding cardiovascular disease, cancer, and cognition. What they found was not encouraging for Pfizer who supplied the Centrum vitamins used in the study. With regard to heart attack, stroke, and cardiovascular mortality, there was no difference between the groups. With regard to cancer, the results were a bit conflicting. While vitamin takers did have a slightly lower overall risk of developing cancer during the study period, the number of cancer deaths was the same (and isn’t that what matters?). With regard to prostate cancer, by far the most common cancer reported, there was no difference in either the incidence or mortality between the two groups. (In two separate studies, multivitamins weren’t found to decrease the incidence of cardiovascular disease or breast cancer, respectively, in large cohorts of women either.) Finally, with regard to cognition and the development of dementia, multivitamin users were no less likely to develop cognitive impairment than their non-vitamin taking colleagues. To add an additional nail to the coffin; a huge meta-analysis of more than 91,000 patients found no difference in all-cause mortality (i.e. death) between vitamin and non-vitamin takers. I used to take a multivitamin but stopped after the results of these studies appeared in 2012 and 2013. This is not to say that there may not be a role for selected vitamin use in targeted patient populations, but for healthy adults the jury is in and it’s a “no” vote on multivitamins. Remember that no matter how cheap the insurance policy, if there’s no payoff at the end then there’s no reason to buy it. Take my advice: Go for a run instead. And while you’re at it, try a subscription to “Nutrition Action Health Letter,” published by the nonprofit Center For Science In The Public Interest. It’s a great source of unbiased information on diet and nutrition. A year’s subscription costs about the same as a bottle of multivitamins and will go a lot further to protect your health (https://www.cspinet.org/nah/). See Nutrition Action, Nov 2013. Howard Sesso et al., “Multivitamins in the Prevention of cardiovascular Disease in Men: The Physicians’ health Study II Randomized Controlled Trial,” JAMA 2012; 308 (17): 1751-60. Michael Gaziano et al., “Multivitamins in the Prevention of Cancer in Men: The Physicians’ Health Study II Randomized Controlled Trial,” JAMA 2012; 308 (18): 1871-80. Rautiainen et al., “Multivitamin Use and Cardiovascular Disease in a Prospective Study of Women,” Am J Clin Nutr 2015; 101 (1): 144-52. L. Chan et al., “Multivitamin Supplement Use and Risk of Breast Cancer: A Meta-Analysis,” Annals of Pharacother 2011; 45 (4): 476-84. Grodstein et al., “Long-Term Multivitamin Supplementation and Cognitive Function in Men: A randomized Trial,” Annals Int Med 2013; 159: 806-14. Helen Macpherson et al., “Multivitamin-Multimineral Supplementation and Mortality: A Meta-Analysis of Randomized Controlled Trials,” Am J Clin Nutr 2013; 97: 437-44. David Schardt and Stephanie Scarmo, “Multi Dilemma: Should You Take One?” Nutrition Action Health Letter Nov 2013. This entry was posted in Uncategorized and tagged dietary supplements, multimineral, multivitamins. Bookmark the permalink. ← I’m skeptical about … strep throat. I think that inventor of the Vitamin “EmergenC” stuff is a genius! All that stuff is is a huge amount of vitamin C that you pretty much just pee out anyway…some people swear by it though! Hmm…could it be that lovely placebo effect??? Once again I enjoyed reading this! Keep ’em coming! 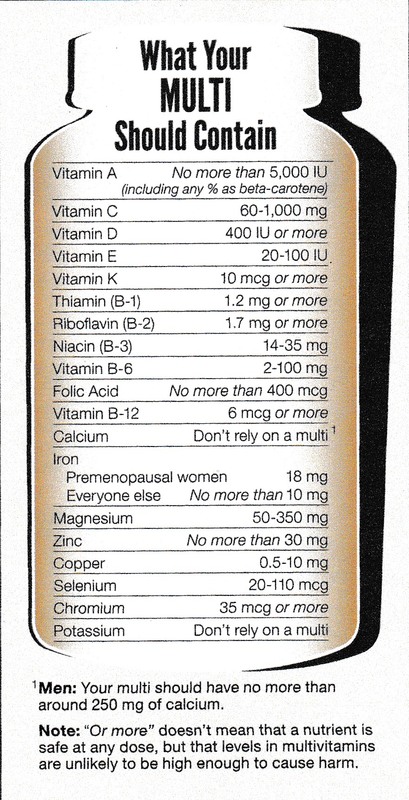 Not to mention the lengthy list of ingredients in multivitamins like Centrum Silver 50+ for Women which include Titanium Dioxide, Talc, Hydrogenated palm oil, FD&C Blue No. 2 Aluminum Lake, FD&C Red No. 40 Aluminum Lake, Polyethylene Glycol, Polyvinyl Alcohol. Talc? You mean the stuff in baby powder? Titanium Dioxide? That can’t be good. After I finished off my last bottle of Centrum Silver I decided that was it. I eat fruits and vegetables every day, and the only supplements I’m taking lately include fish oil and flaxseed oil. I wonder if you have done a blog entry on calcium supplements as most women over 50 are still told that calcium supplements are necessary to help prevent osteoporosis.